A colleague sent me this article from the NY Times recently about how women are typically too cold in an air conditioned office and an “office formula [that] was devised for men” is partially blamed as being the culprit. The Times article also quotes one of the authors of a recent study on the phenomenon as saying “in a lot of buildings, you see energy consumption is a lot higher because the standard [the formula to which I previously referred] is calibrated for men’s body heat production.” And finally, the NYT article goes on to say, “the study says most building thermostats follow a ‘thermal comfort model that was developed in the 1960s,’ which considers factors like air temperature, air speed, vapor pressure and clothing insulation, using a version of Fanger’s thermal comfort equation.” Wow. How wrong can they be? To be clear, Fanger’s equation is used as part of ASHRAE Standard 55 to describe the varying levels of comfort in a space. It has nothing to do with how a space is controlled, nor is it responsible for anyone’s discomfort. 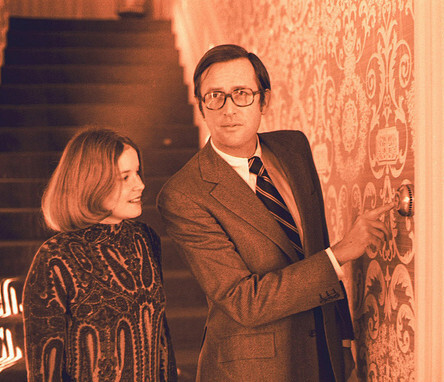 Let’s start with those thermostats that follow Fanger’s equation. Huh? There might be a thermostat out there that does this but I have never seen one and, frankly, I doubt it exists. Maybe they have them on this bad boy but not in our century or on our planet. Thermostats are nothing more than temperature sensitive switches. They turn the heat or AC on or off. That’s it. They are not like a dimmer on your lights or the accelerator in your car and they don’t know how to calculate the PVM as the article would have you believe. Thermostats are a switch. They don’t use fancy equations, or any equations for that matter. Some human being sets it to, say, 73 (the setpoint), and at some temperature slightly above 73 the AC turns on, then at some temperature slightly below 73 the AC turns off. 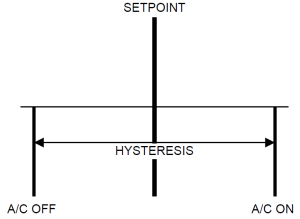 That difference between on and off is known as the hysteresis and is often about 2 degrees. See the diagram below. AC is set to 73, it turns on at 74, cools to 72, turns off, then the cycle repeats. Whether or not that equation from the 1960’s is male-biased is completely irrelevant to how comfortable your office is. Buildings with a Building Automation System (BAS) use the same temperature switches as thermostats. BAS systems, however, have the additional ability to look at things like how quickly a space temperature has changed over time to better match the AC output to the current demand, but Fanger is nowhere to be found in those algorithms. BAS systems use simple PID (usually only PI) controls to match system output to demand. The humans in the office (or the human building manager) determine to what temperature the building is controlled. What about the argument that building energy use is higher because Fanger’s equation was calibrated for men? This could not be further from reality. The equation has nothing to do with building energy consumption because it is not used to control building HVAC systems. Buildings use more energy than they should be because of less-than-optimized HVAC system selection, poorly applied HVAC control strategies, building envelopes that are built only to meet code, if they meet code at all, and improper or inadequate maintenance and operation. The first three can be addressed before buildings are built. The first two can be cost-effectively addressed after the building is built with retro-commissioning and smart retrofits. And the last can typically be overcome with adequate training of the building operators. Is the battle of the thermostat real? Absolutely. It has to do largely with the differing metabolic rates found in men and women and, in my opinion, to a large extent the differences in how men and women dress for work in the summertime. As I said, I do not wear skirts and sandals to work, but my female colleagues do, and sleeveless blouses as well. They are able to dress for the 85 to 90 degree weather and still look professionally acceptable. In most office environments, however, men can’t do that yet. Does the battle of the thermostat have anything to do with an equation from the 1960’s? Absolutely not. Sorry NY Times, you missed the mark on this one. Some thermostats are available with built in PI algorithms for stand-alone use but those do little more than turn the switch into something more akin to an accelerator. Meeting code, in my opinion, is like getting a D. You have done only what you need to do to pass. It is nothing to be proud of.